As the Thunder head into the postseason, the one thing they will be able to appreciate is, hopefully, having a predictable rotation in every game. With Russell Westbrook and Kendrick Perkins resting on one of the two games of back to backs, and with Thabo Sefolosha still out with his calf injury, the Thunder have yet to trot out a complete roster that also features Caron Butler. It will be interesting to see how Scott Brooks handles an influx of players in a time when you should have your rotations down pat. This will the rubber match between these two team. 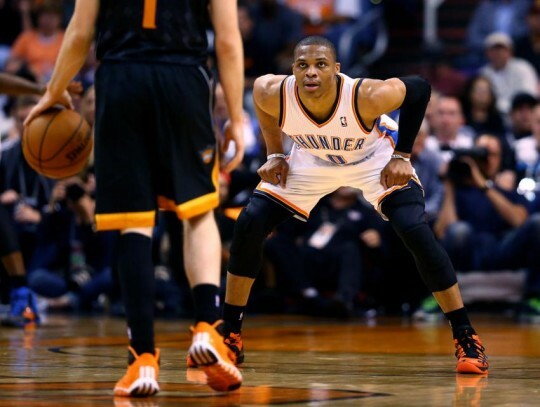 The Thunder won a close one early in the season and the Suns won a barn-burner in their last meeting. The Suns remind me a lot of the Don Nelson-coached Golden State Warriors. A lot of good offensive players that are currently riding a wave. The Phoenix Suns come into the game with a 45-31 record, tied for 8th place in the Western Conference playoff race. Unfortunately, the other team they are tied with, the Memphis Grizzlies, hold the tie-breaker between the two teams, and currently hold the 8th, and final, spot in the playoff chase. The Suns have won 9 of their last 12 games, and play the two teams they are chasing in the final week of the regular season. The team stumbled a bit after the All-Star break, but found their footing when combo guard Eric Bledsoe came back from his knee injury. The combination of Bledsoe and Goran Dragic makes for a lethal backcourt. The dribble drive of these guards is helped by the spacing provided by a bevy of shooters (Gerald Green, Channing Frye, and Markieff Morris). Up front, Miles Plumlee’s athleticism and energy can get teams fits. 1. Front court defense – Phoenix doesn’t really have traditional post players. Plumlee is the only one that could classify as a traditional post player. Fyre and the Morris twins are perimeter oriented big men that usually stay outside the paint. How will the Thunder, with their bevy of paint protectors, counter this? Prepare to see a lot of small ball lineups with Ibaka/Collison at the 5, and KD at the 4. 2. Perimeter defense – The Suns have 6 players who play over 22 minutes a game and shoot over 34% from 3-point territory. This is how the Thunder got burned last game. Look for the Thunder to stay with a shooters a lot more in this game. 3. 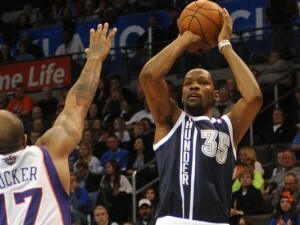 Durant – It was struggle in the last game for Durant to keep the streak going. But, he tied the streak in that game and will be going for the modern day record in this game. Fellow Texas alum PJ Tucker will be tasked with the job of guarding Durant, and you can bet that he will give Durant all he has.